A.M. We had quite a group this morning. Jeff, Josse, Brad, and Daniel. It eventually dwindled to just Jeff and Josse. I did 2 post-VPB pickups, first time 0.375 in 2:05, and then 0.25 in 1:20. Then we found Adam on the trail. Dropped off Josse, ran some more with Jeff and Adam. Dropped off Jeff, finished the run with Adam. Total of 15.1 in 1:58:40. It got colder - 20 F, but no snow on the ground. Just wrote a comment on Lybi's blog that physical youth should continue until 45 under, and remembered that SelectMed (former IHC) decided to give me a birthday present in the form of raising our rate from $268/month to $337. The reason being that I turn 35 on April 21. This makes me furious, and I choose to not restrain the fury. I can mingle with high schoolers and they will not have a clue I am not one of them unless I open my mouth and reveal my ignorance of whatever matters are considered important in their circles, or unless we run a marathon, in which case they would finish far behind. Neither one of those differences should be considered a reason for a higher health insurance rate. This is more than a matter of paying extra $69 a month. This is about having to deal with a system that suffers from people making unhealthy lifestyle choices, knows very well that it does, but at the same time is sufficiently inept to fail to reward those who earnestly and passionately strive to be in good health. I am looking for a health insurance provider that can give our family catastrophic health insurance for less. And particularly for somebody who would honor a healthy lifestyle. If anybody has suggestions, feel free to share. I think we should have a law that requires a health insurance provider to use biological rather than chronological age for calculating premiums. Otherwise, health insurance companies just get lazy and follow the path of the least resistance. P.M. 0.5 with Julia in 5:37, 1.5 with Jenny in 12:36, 2 with Benjamin in 15:15, and 1 alone in 7:31. A.M. 10.1 with Jeff in 1:17:43. Discussed the effect of high mileage on all out speed and high school performances. Supposedly science says that if you do high mileage, the midgrade fibers become more slow-twitch oriented, and that kills your explosive power. If that is true, I must not have any of those because I've never gained all out speed by reducing mileage, or lost it by increasing it. Nor have I ever seen a reasonably well documented case when this has actually happened to somebody. If anybody has one, feel free to share. P.M. 1 with Julia in 10:41, 1.5 with Jenny in 12:41, 5.53 alone in 41:33, and 2 with Benjamin in 15:30. A.M. Tempo run with Jeff. Jeff wanted to do something shorter and faster, and I was not opposed. So we decided to do 3 miles starting at Geneva road, 1.5 out, 1.5 back. The plan was to go 5:30 pace. We stuck to the plan through the first 0.5. Then I led a quarter in 1:20, and Jeff did his in 1:19. This gave us 5:24 at the mile. We were both feeling good so far. Then a devil got into me and I did the next two quarters in 1:17 and 1:18, which gave us 7:59 at 1.5. After that I realized I did not want to run my race today, and told Jeff I did not want to go that fast. He took us through the next quarter in 1:24, which felt great, expect it was too slow. I thought I'd recover from the earlier adventure, and now would want to pick it up, but I did not - next quarter in 1:23, 10:46 at 2 miles followed by a 1:24 up the mini-hill. Jeff had had it, and took the next quarter in 1:21. I took over and eased off to 1:24 without trying. I suppose that is what happens when you focus on not breathing too hard. Then Jeff put the hammer down and hit 1:18 on the last quarter. I reluctantly followed, very reluctantly, but at least I could do it. I ended up with 16:13.8 on my watch. Ran a long cool down, part of it with Jeff, part with Derek Davis on his way to work. Total of 15.6 for the run. Not sure what to think of this workout. It was definitely odd with 5:24.6 average, a mid-mile in 5:14, and a 5:21 mile pieced together of the 4 fastest quarters. Wanting to run 5:10 pace after the first mile is good. Slowing down to 5:36 pace to recover from it, and feeling the effects for so long is bad. I am wondering if I am ready to start racing a half at 5:10 pace in some ways, but some glue is lacking to make it happen. And if so, the following training might supply the glue - run 5:10 pace until I can't hold it without a heroic effort or at all. Stop, jog 200 meters. Try again. Repeat until I have 5 miles total in at 5:10 pace. Any thoughts? P.M. Ran the Costco Relay with my kids. We start at our house, and each kid does his run as Sarah drops them off/picks them up on the way. First 1.06 with Julia in 11:30. Then 1.54 with Jenny in 13:03. Then Benjamin being full of energy ran 21:07 for 2.77 with 100 feet of elevation gain which is 7:38 average. This put my Crocs over 300 miles. Still no holes, but one place in the forefoot wore out to about maybe a half of the original width on both feet. I have run a marathon with a holey shoe before (Moab 2005). The hole was not big at the start, and I thought the race would be all on asphalt, so I would be OK. Then we hit a dirt road around mile 21, and a rock made its way through it which expanded the hole. To make things worse, it started raining too. Then when I got to the finish, the chute was not set up. So I timed myself, and went to work with one other helper to set up the chute and the computers before the second place finisher would make it. My hands were too cold, and not moving very fast, so even though there was a 15 minute gap, we had to time the second finisher manually, as well as third, and forth. After that, everything was smooth. Something interesting always happens at the Moab Marathon. In 2006 I had to crawl under a barbed wire to get to the finish because of getting on the wrong side of it in the last quarter mile. It was on April Fool's Day, but it was no April Fool's Day joke. A.M. Hibernated my way through 15.1 in 1:55:48, 11.1 of it with Jeff. My body thought 7:40 was a good pace, 7:45 even better. This is a good sign. I noticed that when my body wants to hibernate before a race, I often have good races. P.M. 2 with Benjamin in 15:30, then later 2 with Lybi and James in 18:48, and 1 more with James in 9:02. A.M. Brief report. Provo City Half, 1:13:19, 2nd pace after Shin Nozaki, a Japanese runner living in Orem who ran 1:11:20, great time for that course on a windy day. We ran together up to about 5.2, then he made a strong move and dropped me, then kept increasing the gap throughout the race. Full report to follow. Drove up to the start with James, Lybi, and Adam. Warmed up around 2 miles with Adam. The race started 20 minutes late due to the chip pickup problem. I wonder why they were not handing the chips at the packet pickup. Talk to Shin at the start. Checked out the crowd. Did not identify any trouble otherwise, but was aware that some may still be lurking. In the report, I did not use a GPS, and am giving the splits from my $9 Walmart watch by the mile markers painted on the road (as opposed to the race signs. You should ALWAYS go by what is painted on the road on a certified course), and the elevations are from the official race course profile at MapMyRun.Com. BYU ROTC cadets fired the gun. I somewhat embarrassingly nearly missed the turn on 2nd West. The pace felt slow, and I was already upfront. Shin was right with me. There was a headwind, or possibly just a cross-wind on 2nd West. I saw Ted on his bike up ahead, and figured I'd just pull up and get right behind him. So I did make a bit of a surge and caught up at around 0.5 mark. Shin fell back a bit, but then caught up once I had eased off the pace. We already had nobody with us. Made a turn on 800 North and headed towards the Provo River Trail. The head wind picked up, I think now this was a true headwind. We went through the first mile in 5:24, which had a net elevation gain of 43 feet. Good, hope not too good. After about half a mile we finally got off 800 North on the Provo River Trail, finally no headwind. Ted on his bike, I am right on his back wheel, and Shin right on my heels. Second mile in 5:23, net elevation drop of 30 feet. The third mile almost entirely overlapped the course I run almost every day. Lots of turns and going under bridges, ups and downs. Knowing that we were approaching a nasty headwind section I made a couple of moves on the under the bridge micro-downhills to gap Shin, but he would always close. That is one difference between an American and Japanese runner I noticed. The American will do everything he can to not reveal any signs of weakness until he just cannot hide it anymore. The Japanese runners I've raced completely ignored my moves, let me gap them, and then gradually closed the gap. They also make a lot of noises that may trick you into thinking they are struggling a lot when in fact they may still have a lot of juice left. We got off the trail and turned on Geneva Road heading north. Our third mile had a net drop of 16 feet, and we did it in 5:21. 16:08 at 3 miles, 16:43 at the 5 K.
We turned on the Boat Harbor Drive. Now the fun starts. We are directly against the headwind. Missed mile marker 4. 27:24 at 5 miles, 2 miles in 11:36, 5:38 average. Net elevation drop of 43 feet over those 2 miles. A very nice gradual drop. Too bad we could not make good use of it. More headwind fun after that for about another quarter mile. It seemed like it gradually picked up as we got closer to the Utah Lake. I am starting to not feel super-snappy. I can tell Shin is getting a bit antsy to go, but waiting for the headwind to be over. We turn off the Boat Harbor Drive on the Provo River Trail, and Shin quickly shifts gears and picks it up to about 5:15 pace. No response from me, I just do not have it after over 2 miles of fighting the headwind. He is gapping me as if I were standing still. Ted went with him for a while, then figured that since he already had a guy on a scooter with him, he could wait for me to catch up and start yelling at me. I am now getting a lecture from Ted on mental toughness. I've heard those lectures before, but they were directed at his son James while we were pacing him. And now I am getting the grown-up male version of it as well. Clean language, but tough words. At first I just wanted to ignore it but after a couple of minutes I realized that I could either ignore it and run 20-30 seconds slower, or I could obey everything he tells me to do and run 20-30 seconds faster. So I decided to do the latter. 6 miles in 33:04, ouch, 5:40 mile. Elevation gain of 13 feet. While we ran into a headwind on an open section, now that we had the tailwind the Murphy's Law made it so that we had a tree cover. So we were not getting very much of it, and to make things worse, with the trail being windy we were getting a mild cross-wind on some sections. At 6.8 the course overlapped a bit with the earlier section around mile 4, and it just happened that James and Lybi reached that particular point at the same time I did. So I got some cheering from them. Missed mile marker 7. Watching Shin gradually open the gap. Getting a continuous pep-talk from Ted, and trying to respond to it. We got off the trail and headed south on Geneva road. Soon mile marker 8 came, 44:24, 11:20 for the last 2 miles, net elevation gain of 15 feet in 2 miles. With some friendly cross wind and tail wind, a slight downhill, and some strong encouragement from Ted, was able to regroup on the next mile and hit it in 5:27, 49:51 at 9 miles, 21 seconds behind the 5:30 guy. The mile had 15 feet of elevation loss. Mile 10 had some cross-wind and a net drop of 2 feet, but it first dropped 10 feet, and then gained 8. I did miss the mark though. Mile 11 was similar to mile 10 wind-wise, but had a net elevation gain of 5 feet with the initial climb of 10 feet, followed by a drop of 5 feet. 1:01:05 at 11 miles, 11:14 for the next 2, 5:30 guy now has 35 seconds. Mile 12 was the toughest mile of the race. 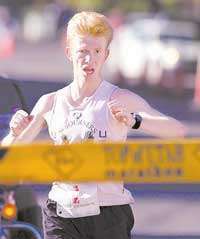 What made it tough was running into a headwind on University Avenue up the railroad overpass. The elevation data from MapMyRun.Com shows a gain of 30 feet, but looking at the actual location of mile 12, it was right on top of the bridge, while MapMyRun.Com shows further climb after mile 12. And the whole length of the course comes out to 13.24. So I assume MapMyRun data is about 0.1 off the certification. This would make the elevation gain to be 40 feet. I ran that mile in 5:59 and was glad it was over when we started going down the bridge. Mile 13 had a lot of turns, headwind for about 0.5, and net gain of about 23 feet in spite of the quick drop of 10 feet in the first 0.1. Caught a split at the 20 K - 1:09:29. That would make it 52:46 for the 15 K from 5 K to 20 K, acceptable for the conditions and the course. I managed a 5:42 for mile 13, 1:12:46 at 13 miles. Tried to pick it up on the last 0.11, but did not have much of a kick due to fatigue and the last of competition nearby - 32 seconds. Got 1:13:18 on my watch, 1:13:19 officially. Afterwards, Ted gave me the greatest compliment - "1:13 is not that bad for that wind!". That was exactly what I needed to hear. It means something to me because I know that Ted does not tell you you did a good job when you did not. He'll say: "What happened, were you sick, did you have a cold, did you have a stomach flu, or are you overtrained?" when you do not run the time that he expected you to run. Since James could run with Lybi only part way due to his recent knee issues, we had planned the operation "Lybi relay". Adam paced her for the first 3 miles, then ran his regular pace the rest of the way passing people and advertising for the blog. James paced her to 8 miles from there, then drove to meet me on Center street as I ran in his direction after the race, picked me up, and took me to a little bit past mile 9 from where I paced Lybi to the finish. I had several concerns for her - slowing down to slower than 12:00 half way through the race due to a severe fuel crash, muscle fatigue, or injury, and how she was going to handle mile 12 with the overpass and the headwind. She performed in the top 20% of the expectation range of what might possibly happen. Her slowest mile was 10:46 (the notorious mile 12), last 5 K in 30:49, 9:54 average, and total time was 2:03:17, very good result for the first half marathon on a tough course on a windy day and with the lack of training recently. P.M. 1 with Julia in 9:15, 1.5 with Jenny in 13:02, and 2 with Benjamin in 15:24. Had to pick up my mom at the airport very late at night, so did not get a lot of sleep. My mom will be with us for the next month. She brought my training logs from 1986-87, I was 12 at the start and 14 at the end. They are all in Russian. I noticed a pattern. Good runs and races are recorded in very neat penmanship, while the entries for the bad ones look like chicken paw or physician's writing. I will enter the info a bit at a time in the next few months. Conversation in the Primary after they announced Cub Scout Olympics. Scott (Benjamin's friend): Last year I won. Benjamin: That's because I was not there to beat you! Scott: I challenge you to a 50 yard dash! Benjamin: I challenge you to a 10 K! A.M. Started from my house with Daniel and Adam. Picked up Jeff at his house. Then ran on the trail. Daniel turned around half-way through, then Adam a couple of miles later. Jeff and I ran to the end of the trail and then back to my house. Then Jeff ran some more, I was done. 11.6 in 1:33:11. Got beat by the 8:00 guy, but I could not care less. Nice recovery run, had a good chat. P.M. 1 mile with Julia in 10:28, 1.5 with Jenny in 13:24, 2 with Benjamin in 15:50. A.M. 12.1 with Jeff and Josse in 1:34:57. Chatted the whole way and did not particularly care about the pace. A.M. 10.1 alone at 5:10 AM in 1:13:23. Started out slow, did not feel like breaking 8:00 by much for a while. Then sped up to around 7:20, with three miles to go to 6:40, and to 5:50 on the last 0.6. P.M. 2 with Benjamin in 17:23. He had an assignment not to break 17:00 today and he somewhat reluctantly complied. Then did some bounds and sprints while my mom and the kids took pictures. I'll post those in a bit. Then 1 with Julia in 11:16, 1.5 with Jenny in 12:28 pushing Jacob (she closed with a 7:56 mile on a whim), and another mile on my own with Jacob in the stroller. Did a 100 meter bound, covered it in 44 steps. A.M. Eventful run. Started out with Hyrum and Daniel. Ran to Jeff's house. Ran back to my house to drop Hyrum off. Saw cops on the trail, police car driving on the trail as well. Saw a truck parked on the 820 N bridge. Something was going on. Then ran with Jeff and Daniel to BYU Smith's Fieldhouse to do a leg extension test. I did 200 on the left leg and 180 on the right. Jeff did 160 on the right and 180 on the left. Then we ran back in the direction of my house, dropped Daniel off and did 4x100 on the trail with full jogging rest. I wanted to do this workout because I noticed that I am able to push my top end speed a lot more when following somebody. So my reasoning was - whatever it is that keeps me from running fast is partially overcome when I follow somebody running fast. Not sure why, but it works, so I should try it. On the first one I got 15.3 (standing start, 0.5-1% downhill grade), then another 15.3 from a standing start slightly rolling and into a mild headwind. Then 14.7 jogging start, rolling and into a slight headwind. The last one was 14.3 from a jogging start, slightly rolling and with a slight tailwind. Jeff put about a second on me on the last one in the last 50 meters or so. After doing this I think I've figured out what is going on and I am very excited about it. Suppose I am following somebody at 5:00 pace until I can't. Well, I can run with bad form and by the time I know it I am too tired to do anything about it. I just cannot hold the pace anymore. I can even do the same all the way up to 4:00 pace. But if you make me go 3:50 pace, I can do it for a little bit, but not unless I fix the form. If I am running with bad form, I know immediately because I start falling behind. This critical training speed needs to be fast enough that it is impossible to run with bad form but slow enough that I can do it within my ability to auto-correct. The only way I can keep up the pace at all at that speed is by running with a better form. I do not need to know what it is that I am doing wrong as in not lifting up knee, not extending the leg, running too tight, etc. Nor do I need to worry about it. The desperation of being left behind and the lightening fast immediate feedback makes me intuitively find it and fix it. A bird decided to make our run more eventful and did number two on Jeff. I asked him if he knew if birds did number one as well. He said yes, and he happened to know it from personal experience as well. P.M. 1 with Julia in 10:49, 1.5 with Jenny in 13:16, 2 with Benjamin in 16:00 with 2x100 in the middle, first in 19.4, second in 17.8. This was Benjamin's PR in 100 meters. He also decided to run the last quarter fast, we did it in 1:33. A.M. Easy run, started out with Hyrum, ran to Jeff's house, then we all ran together to my house and dropped Hyrum off. Then ran 7.5 more with Jeff and finished the last half mile by myself. A devil got into me with a quarter to go and I picked up the pace, the last quarter was 1:25, total time for 10.3 was 1:19;58. P.M. Drove to St. George to go to Zion's Park. Stayed with Steve and Kendra. Did my second run there. 1.1 with Julia in 11:57, Isabel joined us for the second 0.55, Julia was a great pacer: "Come on you can do it. Just say I think I can I think I can like the little engine. If you get a side ache hit yourself on the side and breathe in deep and out." Then 1.65 with Jenny and Steve in 13:02, and 2.2 with Benjamin in 15:43. Then 6.7 with Steve in 52:00. A.M. Had an interesting dream. Was racing Dave Holt in a marathon. We got to mile 18. I wanted to drop him. Decided the only way I'll be able to push myself to achieve this would be if I started screaming. So I started screaming, in the dream and in real life as well. This woke Sarah up, she punched me and told me to be quiet. Ran 20.1 with the St. George Running Club in 2:13:38. Started at the St. George Running Center. Crew: Steve Hooper, Wild Bull, Dustin, and Ken Carlson. Clyde was not there to push the pace, but Wild Bull did it for him instead. So the whole run was somewhat of a fartlek. Wild Bull pulls away, then Steve tells me where the next turn is, I catch Wild Bull to make sure he does not get lost. Add a post VPB catch-up to it as well. Then around 10.6 or so Steve started to push the pace. We moved into sub-6:00 zone, eased off out of it, then moved in it again. Then we saw a sign "reduced speed ahead", and I asked Steve if he wanted me to take the wind. He said sure, so I did. Instead of reducing the speed with the help of some downhill we increased it first to 5:30, then 5:20, and then 5:00. Hoped to find a bathroom at the Hamblin's house during Steve/Ken's water break, but it was locked. Decided to go another mile and a half. At that point Steve stayed behind, and I ran with Ken. Then it was Ken's turn to push the pace and he briefly went into sub-6:00 zone, but then eased off. After my bathroom stop which this time provided some real rather than virtual privacy, Steve caught up to us and we ran together again. Then we saw Marcie. Ken and I just gave her a Brezhnev's wave (this reveals my age, I remember seeing it on TV quite a bit), while Steve stopped to talk. With about 1.5 to go I challenged Ken to pick up to sub-6:00 and he did, and was able to hold it until we got to Steve's hill where he slowed down to around 6:15-6:20, but effort-wise it was probably worth 5:50. Finished at the St. George Running Center. P.M. 1.5 with Benjamin and Jenny in 13:08, then another mile with Benjamin in 8:04. Made up on the sleep. Heard a good talk in church. One brother was speaking about his ancestors. Some did interesting things like riding in two truck next to each other and reaching out from one to the other with a metal pole. They learned you get nice electric shock this way. But on the more serious side, he had a good story about his great grandfather. His family came to America on a boat. He was a baby. On the ship he contracted plague and they thought he had died. The rule on the ship was they had to bury the dead in the sea. The mother refused to bury the baby in the sea and hid him in a trunk. Right when they were about to get off the ship they heard crying from the trunk. The baby was alive. A.M. Ran with Jeff. We did 8x100 in the middle of an easy run. Missed the split on the first one. 15.6 on the second, then 15.1, 14.7, 15.1, 14.9. Then we did a 100 meter bound test. I covered it in 42 steps, Jeff did it in 45. Then I wanted to see what Jeff could run all out. He did not have his watch, so I gave him mine. To make things interesting he gave me an early start and chased me down. However on the first try he timed himself at the wrong mark - too early. So we did it again, but did not give him enough rest - only 100 meter jog back. The second time around he ran 13.6. Dropped Jeff off and ran some more - total of 15.2 for the run. P.M. 1 mile with Julia in 11:38. Then 1.5 with Jenny in 13:09, and 0.7 alone in 5:08. Then 2 with Benjamin in 16:53 with a 200 meter time trial in the middle on the trail done twice. The first one was on a slight uphill and we had to go around a dog - Benjamin went all the way to the grass, he is afraid of dogs. He still got a PR of 40.6. Second time around we ran on a slight downhill and he ran faster - 38.6. A.M. We had quite a company for 5:30 AM - Jeff, Hyrum, Josse, Michelle, and Brad. Michelle and Josse were running the Uneventful Half. Brad and I started with Hyrum at a slower pace, hit the first mile in 8:21, then Hyrum turned around at the mile as planned, we shifted gears and caught Michelle, Josse and Jeff right before 2 miles. We were going a bit under 6:00 at first, then sped up to around 5:40. Our mile split was 5:58 but that included easing off to around 7:00 once we caught up. Then I had a VPB a bit after 3 miles, and caught up in about 0.4 miles. Timed 500 of it in 2:06, a bit under 5:40. We cruised along at a bit sub-7:00 pace after that until Josse started struggling. Brad and I stayed with her while Jeff and Michelle went ahead. Then Brad had a VPB, and never caught up. Josse and I continued. She had a small mental lapse right before the 10 mile mark, but then recovered and was able to finish strong - 6:59 on the last mile, and 1:34:07 for the whole distance - new PR for a loop course. Afterwards jogged about a quarter with Michelle and Sarah, then went for another 2 miles and found Josse's gloves on the trail. Total time for 15.35 was 1:51:46 minus VPB time. This was actually a brisk pace. Jeff and I have been really enjoying nature and conversation lately running as slow as 8:00 on some runs. Our near all out sprints did help in that cause though - you do not feel like going much faster than 8:00 for a while after sprinting and you need to jog very slowly so you could sprint well again. P.M. 1 mile with Julia in 10:56 pushing Joseph in the single stroller with Jenny riding a bike. 1.5 with Jenny running, Julia and Joseph in the double stroller, in 13:02. Saw Ben Crozier on the trail with a girl, it is about time, he is 31 years old, 4 years past the menace to society age supposedly defined by Brigham Young. Stopped to talk to them. He said he would run with us Friday morning. Added another mile in 9:29 with Benjamin and Jacob in the double stroller. Benjamin was not feeling well, which why we ran less and slower than normal. Then another 1.5 in 11:47 pushing Jacob in the double stroller. A.M. Did not get good sleep. Had odd stomach issues in the middle of the night. Ran a total of 10 miles, 2 of it with Hyrum, most of it with Jeff. Easy pace, around 8:00 average. Jeff and I did a standing broad jump test on the sidewalk by my house. There was some headwind which skewed the results but it was probably equal for both us, and all we cared to know was the comparison anyway. He jumped 7 feet and 5 inches, I did 6 feet and 7 inches. In summary, our differences in power exercise measurements with Jeff - leg extension - I am 10% stronger in raw power, but 4% weaker relative to body weight. All out speed - we have not done a good measurement yet, but comparing 100 meter PRs (12.6 vs 13.9), which appears to be consistent with the differences we get during our sprints as well, Jeff is 10% faster. 100 meter bound (cover the distance bounding in the smallest possible number of steps) - my average stride is 7.1% longer and I also move faster. Height difference - I am 3.6% taller. Standing broad jump - Jeff jumps 12% further. P.M. Windy and rather cold. 2 with Benjamin in 16:31. He felt significantly better. 1.5 with Jenny in 13:12, and 1 with Julia in 10:58. Then 5.5 alone in 38:14 with one event. I saw two girls on roller skates shortly before my turnaround. After jogging a bit my "impress the ladies" instinct woke up. After being married for over 11 years I still have it. I still could not see them, but I figured if I go about 5:40 pace I'd catch them pretty fast. So I ran a 5:32 mile passing them about half way, then eased off back to 7:20 or so.